This school offers a traditional online auction. I oversee a smaller silent and live auction onsite. Enjoy this series on determining the best number of auction items for your event. How many silent auction items are best. How many live auction items are ideal. This post covers how many online auction items are good. The influence of mobile bidding on terminology. I’ve not written much about online auctions, though I probably should. There are a lot of questions about them. Recently the competition from mobile bidding vendors has changed the vendor landscape a bit, but traditionally the most established online auction vendor for nonprofits was Bidding For Good. I took lots of notes when I heard the founder / CEO speak at a workshop they sponsored in San Diego, CA. And back in 2010 I organized a free training with a product manager from AuctionAnything, another online auction vendor. If you’ve been part of my online family for awhile, you might have participated in that complementary call. In addition, my clients use a number of other online auction platforms of which I have arm’s length familiarity. Most times, if my client is already using a software vendor such as GreaterGiving, Mastro, SchoolAuctions or any of the other two dozen companies in that space, my client opts to use the online auction platform already provided by their vendor. I share this to explain that the information in this post is a conglomeration from what I’ve heard from vendors and seen via my clients’ individual results. Last year I consulted with one Tulsa, OK nonprofit that was going to run a stand-alone online auction. Among my clients, that’s rare. Most of my clients offer an online auction in conjunction with some onsite auction activity, usually a gala dinner auction. Ballpark estimate, I’d say 25% of my clients (primarily schools) offer an online auction as one component to their onsite fundraisers. When I’ve asked online auction vendors about the ideal number of auction items for an online event, I’ve been told it’s limitless. When the entire world can bid on your items, the Scarcity Principle we talk about in silent auctions doesn’t exist. But another factor exists: time. In a live auction we’re constrained by program length. Similarly, in an online auction we are constrained by how long a reasonable bidder will stare at his computer screen, reading about your items. While writing this article, I tried to locate a Facebook discussion I’d read in one of my private auction groups. A number of commercial auctioneers who ran online auctions were sharing best practices about the ideal number of auction items for their own sales. There was a lot of chatter, but I seem to recall that one number put forth was 300 lots (or was it 200?). Auctions with more lots became unwieldy for bidders to navigate. They lost interest. Realize, of course, that one reason a commercial online auction is different than a nonprofit online auction is that commercial buyers may often be online with plans to buy a specific item. 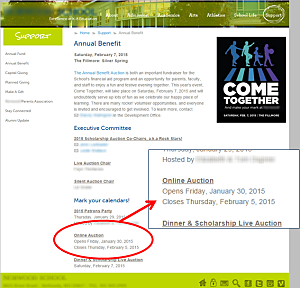 With nonprofit auctions, it’s more about me browsing your catalog to see what tickles my fancy. Which means an online fundraising auction needs to keep a shorter item count. 1. As a method of dispersing duplicate items. If my client receives two $100 gift cards from a restaurant, one goes into the online auction and the other is sold onsite. 2. As a way to conserve limited venue space. Don’t overcrowd silent auction tables with 200 items. Cull donations. Sell choice items onsite and the rest via online auction. 3. Sell donations that need exposure to a larger bidding pool. For instance, if a summer camp is for 9- and 10-year-old children, and just three sets of parents with a child that age will attend onsite, sell the camp online. It allows all parents of all 9- and 10-year-old children to bid. 4. Sell last-minute donations or time-sensitive packages that must be consumed. For instance, when you get a donation on June 1 for tickets to a pro-baseball game on June 6, you need to sell those online. 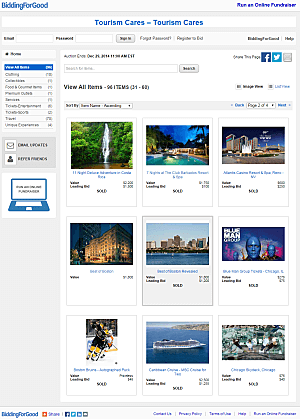 This screenshot of a closed online auction allows bidders to see winning bids and other information. When an online auction closes, bidders can often see the results — the winning bid, which items sold or didn’t, and so forth. The auctions I’ve watched suggests that the item return on investment (ROI) for the online auctions is slightly under or the same as a typical silent auction. If you have too many silent auction items, run an online auction to reduce the onsite item count. The idea is that you can use the online auction to create the competition you seek to drive prices higher at your onsite event. Are you reading our minds? Our synagogue has had an annual Silent Auction for many years. About 4 years ago we signed up with BiddingForGood and added an online auction. It’s always a balance and a question about which items to put in both or which to have out in our lobby for bidding and not online. This year for the first time, we are also adding a live auction at our event, Champagne Brunch and Auction. We’re excited but there are questions about how the live element will work, especially since our speaker is attracting many of his fans who may not even be interested in the live auction and it’s our 36th Anniversary so we want to pay homage to that as well. You addressed every question I had in my mind for each aspect of our auction. Wow!